It wasn't long ago that I discussed some of my favourite documentaries. 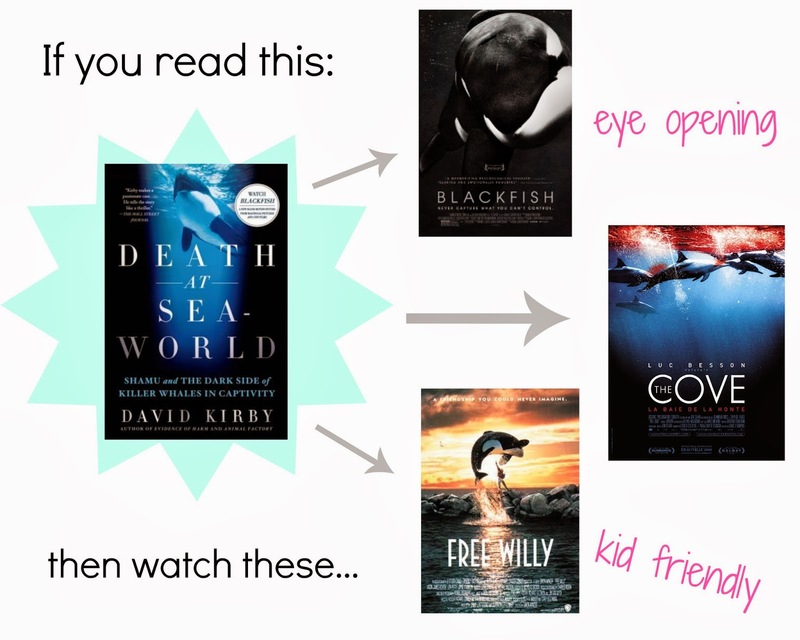 One of them, in particular, led me to my current read, Death at Seaworld. This book looks at the dark side of Seaworld and the science behind and the costs of keeping cetaceans in captivity. Blackfish is the eye opening documentary about, Tilikum, the infamous killer whale who is allegedly responsible for the deaths of three people, including senior whale trainer, Dawn Brancheau. It asks deeply moral questions while exploring the devastating and, often, deadly consequences of keeping killer whales in captivity. For a more family friendly version, you might want to watch the 1993 hit, Free Willy. Conversely, if killer whales aren't your thing then try watching The Cove, which exposes the cruel and abusive practice of corralling wild dolphins for sale and slaughter in Japan. So, I want to know what you think of the new feature. Are there any books/movies you'd like to have recommendations for? I want this to be an interactive feature where we make suggestions to eachother. Have you read this book or seen any of these movies? As always, leave your own thoughts in the comments below! Oooo what a fabulous idea. I love reading a book and then finding movies that go with it, but I've never thought of documentaries. Great new feature! I can't wait to read more of these posts! Is it funny that I just spent all day Sunday re-creating an old feature of mine dealing with book recommendations...it's like yours but only with books? Great minds think alike. I actually really enjoyed watching Blackfish. So I may have to try out that book. If you could recommend some movies for fans of Delirium that would be cool. Although I don't know if there are those kinds of movies but I think you would know better than me, or maybe warm bodies...I have a feeling there are some unique zombie movies I'm missing. Some other non-fiction ones would interest me as well. Okay really anything would. :) It might be interesting to do some fairy tale movies...I'm done rambling. Hope some of my ideas helped. You're right, Kay! Great minds DO think alike! Death at Seaworld is a little long for what it is but there's a really cool conservation/scientific angle to it that makes the book really unique. And yeah, my next post will be in honour of your Delirium suggestion. I'll let you know when that's done. Super excited for this! I haven't read the book (I second Kat, I'm not helping, I know) but I LOVE THIS FEATURE! Yay! Thanks Vicky! If you have any suggestions, come back and let me know. Well, you know how I feel about Blackfish. What an eye opening documentary. I have to watch The Cove since you've brought it to my attention. Have you seen The Whale? It's directed by Ryan Reynolds. It's about a baby orca named Luna who was lost and wound up living near the shore in Canada. It's a sad documentary, but it also showcases the intelligence these amazing animals have as well as show the dangers of people interacting with them close up. I made this post for you, actually. I remember you told me about The Whale but I haven't seen it yet. Sounds so heartbreaking but something that NEEDS to be seen. I'll definitely check it out.